Seven years ago, when I first saw that pastel pink Vespa (a princess in her own right) in the display window of a shop downtown, I was instantly in love. How could I not be? Her cupcake pink hue, her gleaming chrome, her style – I had to have her. And every opportunity I got, I would go down and stare at that little princess, envisioning myself atop her, with a smile that could only be accented by Marilyn red lipstick, and a rosy glow on my wind-flushed cheeks. The logistics of my commute, however, just didn’t work for a Vespa lifestyle. And soon, my pink princess was sold. 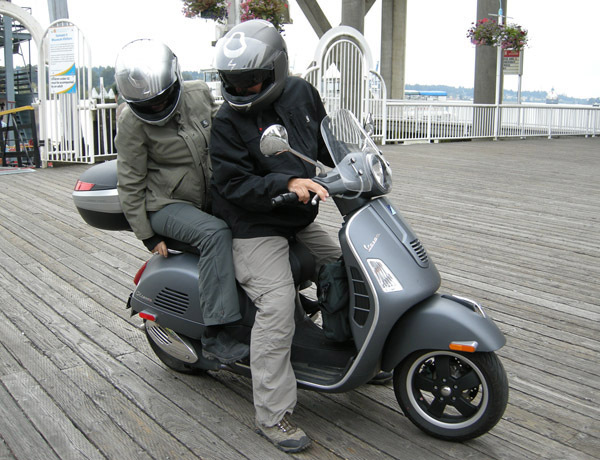 Fast forward a few years and the love for the Vespa hit me again, smack hard in the face. Big Ring and I were in Nice at the time, checking out an Italian festival. While his eyes were drawn to the shiny red Fiats on display, mine were instantly magnetized to the sparkling red Vespa in the centre of the courtyard. Ohhh she was a beauty. But then, earlier this week, she came back full force by way of a black beauty named Bellina. This weekend, our New York friends (who are more truck-driving nomads than New Yorkians these days) came into town for a quick lunch visit between loads. Rather than come in on their big rig, which admittedly would be a nightmare to park in our community, they spun in on their Vespa beauty. And instantly they became the object of my envy. This entry was posted in Travel, Uncategorized and tagged Big Ring, France, Life With No Fixed Address, New York, Nice, Vespa. Bookmark the permalink. 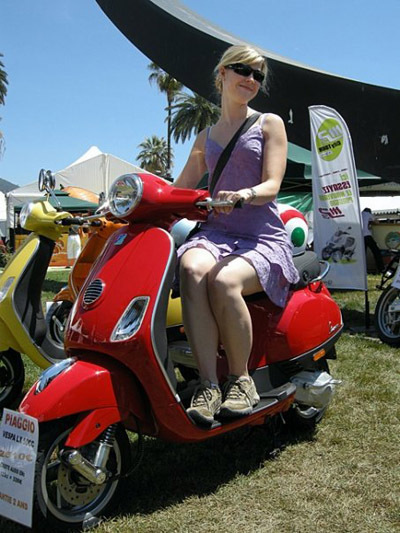 i too a a big fan of the Vespa – and one of these days, i’m goin’ get me a ticket to ride! Your so funny:) That picture is great…cute! You’re right. You should definitely have her. You look much more stylish on her than we do, like she was built for YOU! totally should have had a photo shoot! you are so beautiful.